While Alec Baldwin has been, let’s call it noncommittal, about continuing on as Saturday Night Live’s resident Donald Trump, last night’s Louis CK-hosted episode saw season 42’s permanent guest star take the joint over. 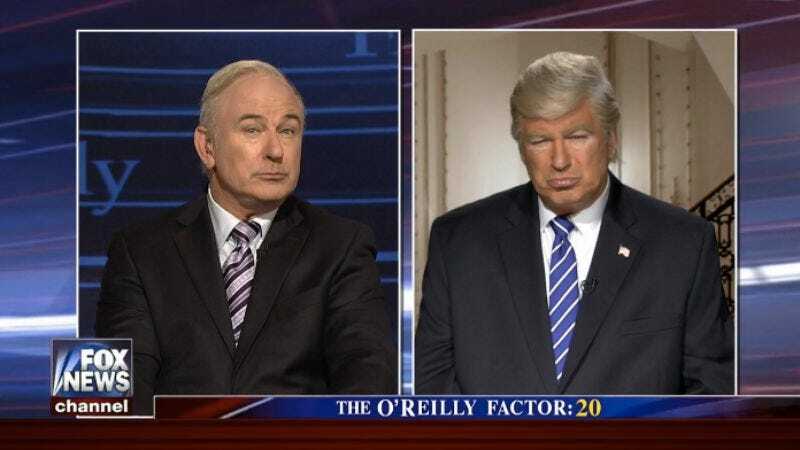 Apart from appearing in the requisite “Donald Trump makes a fish-mouth while saying stupid and horrible things” cold open, Lorne Michaels turned over a second sketch to Alec Baldwin… and another Alec Baldwin. Eschewing the slew of no-doubt very available brother Baldwins for the idea of a Bill O’Reilly interviewing Donald Trump O’Reilly Factor sketch, Michaels instructed his Baldwin-loving crew to use some TV magic to have Baldwin-O’Reilly and Baldwin-Trump commiserate over their distressingly similar sexual harassment allegations/lawsuits/settlements. One might quibble with Baldwin’s impressions, or the fact that a typically overcrowded Saturday Night Live ensemble is being crowded right off the stage by not one, but two, Alec Baldwins. But the sketch—which notes that Trump leapt to O’Reilly’s defense mere days after proclaiming April Sexual Assault Awareness Month—will no doubt engender twice the amount of Baldwin-hate from the actual Donald Trump. Which, if nothing else, might keep him pushing Twitter buttons rather than missile launch buttons for most of Sunday.